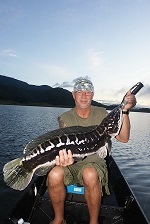 Austrian angler Andreas ventured up to Mae Ngat Dam in Chiang Mai fishing for Giant Snakehead. After recently catching a monster sized Giant freshwater stingray from the Maeklong River the Austrian angler decided to target the elusive and highly prized Giant Snakeheads. On arrival at the dam Andreas began to cast his lures into likely looking holding areas. Expertly retrieving a variety of lures the angler caught several Giant Snakeheads with relatively low weights of between 1-2kg’s. Andreas continually changed lures to keep in contact with the fish using a combination of surface poppers, Pencils and buzz baits all accounting for fish. The second day saw Andreas returning to the lake in search of a much larger specimen. Fishing an isolated area littered with submerged trees the angler made a series of casts casting his lure towards the nearby structure. After several casts the water erupted as a large Giant Snakehead slammed into the lure! With line being pulled from the carefully set drag on the reel the angler vigourously set the hook into the voracious predator. Angrily thrashing its head the Giant Snakehead made a series of deep dives towards the nearby sunken trees causing the angler to bend the rod fully into the fish in an effort to stop its powerful run. After turning the snakehead away from the danger area the fish proceeded to charge up and down the bay. After expertly playing the fish for several more minutes the fish was finally netted alongside the boat and hoisted into the boat. 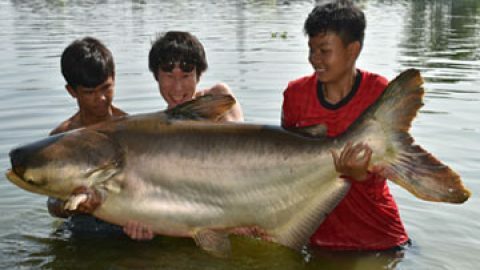 The Giant Snakehead was weighed at a massive 7.2kg’s before being released back into the reservoir. The monster Giant Snakehead was the largest fish caught in recent months from Mae Ngat Dam and was followed by several much smaller specimens later that afternoon.